Paint, color, and adventure are in the cards for Mario's final Wii U outing. 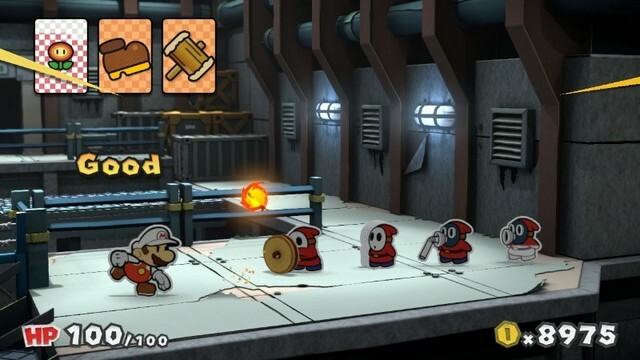 There is no denying that many fans of Mario and particularly the old school Paper Mario games were fuming at the changes the developers of the series made starting with Paper Mario: Sticker Star on the Nintendo 3DS. Battles were borderline meaningless, the story was bare bones, and the game's puzzles and level design were about as obtuse as a game could get. 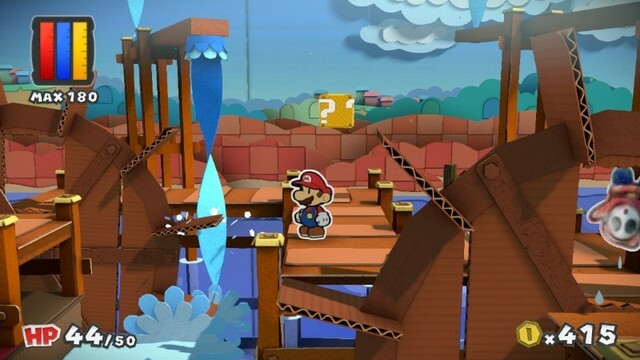 Thankfully, the developers took the criticism of Sticker Star to heart, and while the Wii U's Paper Mario: Color Splash isn't the type of traditional Paper Mario experience old fans would like, it's a marked improvement over Sticker Star and just a fantastic game in general. Right away from when you first insert the game disc into your Wii U, load up the game from the system menu, and are greeted with the title screen, you'll find yourself amazed by the high-definition visuals of Paper Mario: Color Splash. The game was one of the most visually impressive games of last year with its bright, vivid, and colorful graphics. 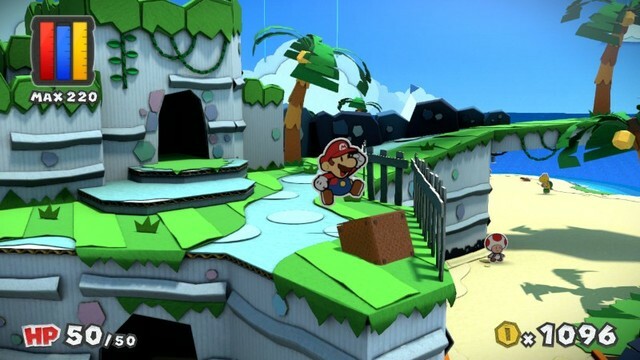 Paper Mario was already a looker on past consoles and handhelds it made an appearance, but it looks better than it ever has (and amazingly so) on the Wii U in jaw-dropping HD. The environments, the characters, and the effects like the smattering of paint that splashes from Mario's hammer upon a super successful hammer attack in battle all look wonderful. Everything is devised up of paper and cardboard, making this world so engaging on the eye to gaze upon. The exhilarating presentation doesn't end with just the visuals. The music is also absolutely fantastic. It sports the typical range of classic Mario tunes like the Super Mario Bros. main theme and the underground theme, but also other themes not used as much, such as Super Mario Bros. 2's overworld theme and the rarely remixed Super Mario Land ending theme, as heard in the Roshambo Temple victory themes. But it's not just the familiar Mario tunes that make Paper Mario: Color Splash's soundtrack so special. The original tunes are absolutely amazing to listen to, offering real instruments, satisfying melodies, and splendid arrangements. It was one of SuperPhillip Central's soundtracks of 2016 for a reason. Paper Mario: Color Splash begins with Mario and Peach receiving a mysterious letter from Port Prisma. The letter reveals itself to be a completely stolen-of-color Toad. This sends the pair to Port Prisma to investigate, finding the previously colorful locale to be almost entirely of devoid of color. It isn't limited to Port Prisma either, as the problem emanates throughout Prisma Island, and it's probably no real surprise who the culprit is either. However, the game's story is complemented well by its humor, which had me smiling or full out laughing more than any other game I can remember in recent memory. The humor is sometimes dry, sometimes self-deprecating, sometimes referential, sometimes slapstick, but always smartly done. Nintendo Treehouse did a tremendous job with localizing Color Splash to make for a highly humorous and downright funny game without needing to succumb to relying on cheap humor like memes and grating pop culture references. 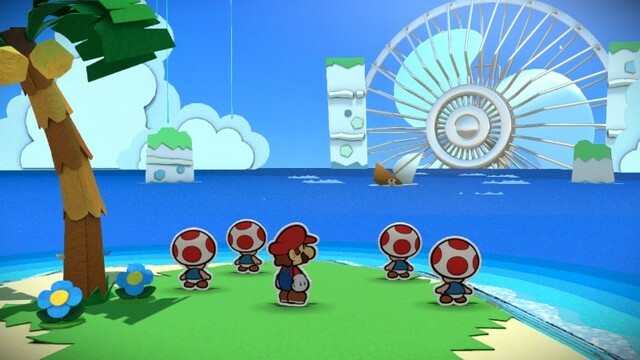 Paper Mario: Color Splash uses a course progressing system just like Sticker Star to proceed through the game. Each course you go to has different puzzles and problems to solve in order to reach the highly desirable Mini Paint Stars, used to unlock new courses on the world map of the game. Some of these Paint Stars are a bit lame, as they are located nearby another in the same course. 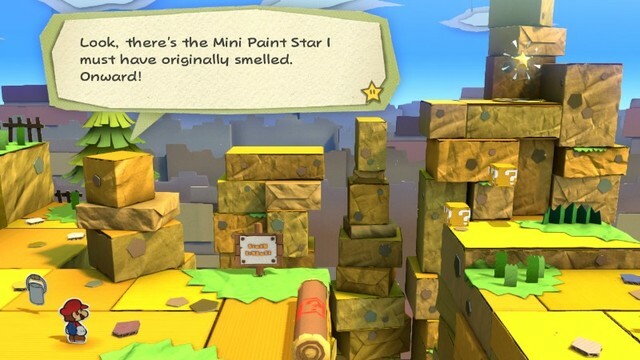 Because you get kicked out of the level once you collect one Paint Star, that means you have to go through all the way through the same course just to reach the same location where a second Paint Star is located. Still, this problem isn't too bothersome and doesn't happen too much. It's just notable when it does. Also like Sticker Star, Color Splash uses Things, which are ordinary, everyday objects that intentionally clash with the visual style of the game, being more realistic 3D models instead of made of paper or cardboard. A big issue with Sticker Star was how obtuse some of the locations to the Things were, as well as the game being completely mysterious as to when and where to use certain Things. Like many problems with Sticker Star, Color Splash fixes this issue by sometimes giving players full notice when a specific Thing card will be needed. Furthermore, a particular Toad at Port Prisma's dock will even give hints as to what Thing card is necessary for the next location in the story you need to go to, as well as a hint on where to find the Thing in question. You can even use a nearby Toad to turn previously collected Things into Thing cards without having to go to the original course and location you found it. These are major changes that are extremely helpful. Another issue with Sticker Star was how battles felt trivial, as winning them didn't do much of anything besides waste previous stickers to use for boss encounters. This is remedied in Color Splash. Like past Paper Mario games, battles are much more active than they are passive like they are in typical turn-based RPGs. Performing actions like offense moves and blocking is done with timing the pressings of buttons. For instance, using a Jump card requires five successful button inputs made just before Mario makes contact with an enemy in order to deal the most damage. While Mario loses HP when damage, enemies lose color when they get attacked. You see, as enemies take damage, their color diminishes, starting from the bottom. The closer they are to being defeated, the more the white that begins at the bottom reaches their top until they are defeated. Instead of using stickers in battle like in Paper Mario: Sticker Star, Mario uses cards in Color Splash. However, like Sticker Star, cards can only be used once before they are depleted from Mario's arsenal. That said, unlike Sticker Star, cards are much more easily collected. They're found in item boxes, found from painting colorless spots, and readily available in Port Prisma's card shop, where spending coins isn't a big issue because coins are so easy to collect in Color Splash. On many occasions in the game, don't be surprised if you have the maximum amount of coins you can possibly hold since coins are so easily available. Battles serve a worthwhile purpose in Color Splash, where, as stated, they didn't in Sticker Star. Completing battles gives you little paint hammers from fallen foes that when collected, slowly fill up a hammer gauge. When it's fully filled, you receive an increase in the maximum amount of paint Mario can hold. Paint is not only used to paint colorless spots in courses, but it's also used to paint color-deprived cards in battle, increasing their attack power and overall effectiveness. There's plenty of strategy involved in whether you want to revitalize a colorless card, making sure you're rationing your total paint supply to the best of your ability. Paper Mario: Color Splash offers a plentiful amount of fun in its 30-40 hour run time. Simply following the story and beating the game is enjoyable, but Color Splash sports side content to add to the longevity of the experience. For one, you can donate cards collect along Mario's journey to a secret museum found in Port Prisma that takes Battle, Enemy, and Thing cards. You can also try to paint all of the colorless spots in each course (the game keeps track of the percentage you have colored in a given course, as well as plants a gold flag on the world map next to the course you have painted 100% of its color-devoid spots). There are also Rock-Paper-Scissors themed Roshambo Temples of which there are eight throughout the game to beat. While some of the encounters are annoyingly random, it's an easy way to make bank and the only way to earn Koopaling Enemy cards. Despite fixing most of the problems that plagued the still somewhat enjoyable Sticker Star, Paper Mario: Color Splash isn't at a loss for problems. For one, instead of wholly original characters as seen in the first Paper Mario, the GameCube's Thousand-Year Door, and the Wii's Super Paper Mario, what you get in Color Splash is a whole healthy heaping of Toads as the major NPCs. Rarely are there even Toads with discernible visual traits to them like sunglasses or scarves, so this can very much bring down some players' experiences. It didn't with mine as the humor was so good regardless, and I liked seeing other familiar characters from the Mario mythos have personalities in-game. Also, some segments of Color Splash are annoying if only because they are sequences where failing them is an instant game over, bringing you back to the title screen. Some sequences I didn't know what to do and had little time to figure it out before seeing the words "Game Over" in front of my face. Finally, some other segments of Color Splash wear thin, such as the constant moving up and down between floors to solve the paranormal problem in Dark Bloo Inn, as well as a certain high seas section in the game that outwears its welcome. Other than those problems, Color Splash is a wondrous and really sensational adventure. Paper Mario: Color Splash may not be the Paper Mario game that longtime, devout fans of the original games want (far from it), but for those like me who don't mind the insistence of Nintendo to stick with this new formula founded in Sticker Star, Color Splash is a mighty fine game that's well crafted, full of wit, charm, and personality, and possesses clever puzzles, interesting level designs, and has packs a punch in the adventure department. Color me surprised with how impressed I was with this delightful and colorful adventure.